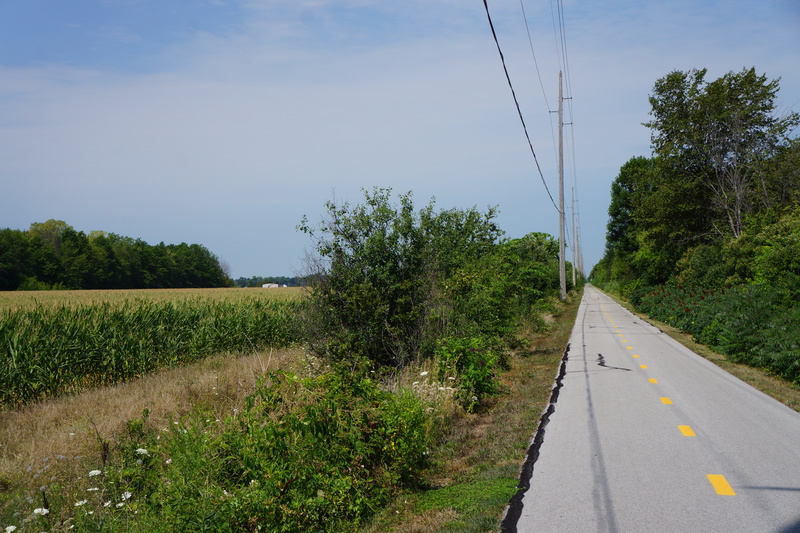 Mile 68: Today we rode 9 miles on the North Coast Inland Trail pictured here which runs from Fremont to Clyde, OH. While not very scenic, it was quiet, offered some shade, and was flat. There was not much of note today except that it was a long (95 miles) and hot (high 80s) ride. Fortunately, the humidity stayed low (<30%), but you could hardly tell. I didn’t take any meal breaks and made good time so arrived first at the hotel (1:45 pm), even before the SAG wagon. I treated myself to a Southwest Salad at McDonald’s across the street from the hotel while I waited for the luggage to arrive and our rooms to be available. Dinner was at Applebees, my 4th dinner at Applebees during the trip, which has turned out to be a reliable place to have a good, if not varied, dinner. 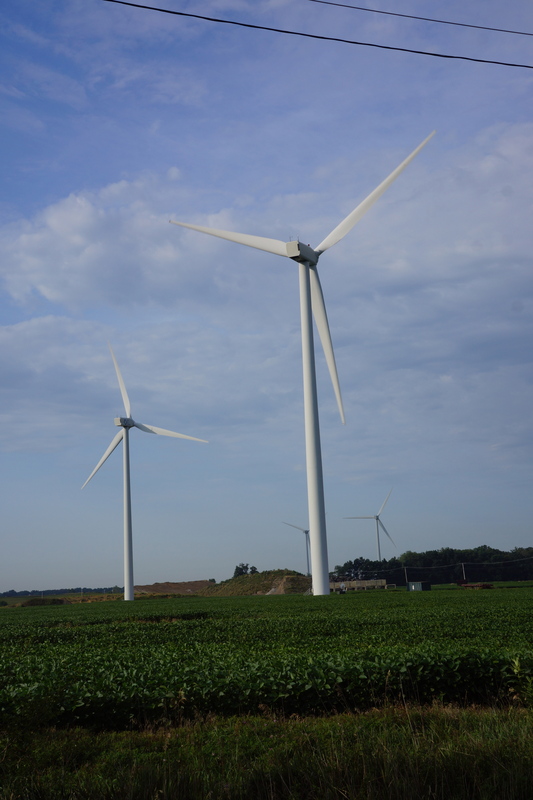 Mile 32: Another small windmill field near Tontogany, OH. 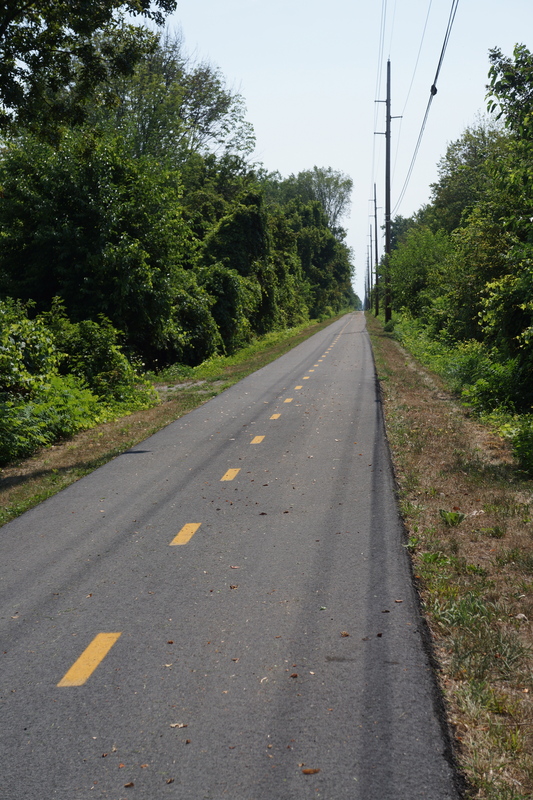 Mile 70: Another view of the North Coast Inland Trail between Fremont and Clyde, OH. tired just reading about it!!! Mile 70….it looks like there is a gopher on its haunches in the road, but upon zooming in I see it is just tar on the road. Are lunches not included? Applebees sounds reasonable. Are you allowed to order anything you want? Or are you handed a dollar limit or a sub-menu. We were given usually a sub-menu, and once in a while a dollar limit. Once in a while the dollar limit was ‘the sky’.